Congress 'owes the American people a final up or down vote on health care. 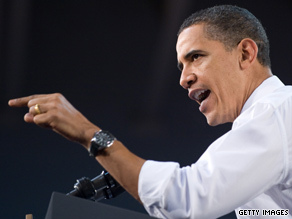 It's time to make a decision,' President Obama said Monday. Glenside, Pennsylvania (CNN) - President Barack Obama tore into private health insurers for recent rate hikes Monday, taking a more aggressive rhetorical turn as the administration continued to push for final congressional passage of the president's top domestic priority. He repeated his assertion that the plan now being considered includes the best Democratic and Republican ideas. The time for debate, he argued, has ended. The White House has called for sweeping reform legislation to be on the president's desk before the congressional Easter break at the end of the month. Congress "owes the American people a final up or down vote on health care. It's time to make a decision," he told an enthusiastic crowd at Arcadia University near Philadelphia. "Stand with me and fight with me. ... Let's seize reform. It's within our grasp." Two Democratic leadership aides told CNN last week that Speaker Nancy Pelosi is aiming to have the House of Representatives pass the Senate's health care bill by March 17. A separate package of changes designed in part to make the overall measure more palatable to House liberals would then be approved by both chambers - getting through the Senate under a controversial legislative maneuver known as reconciliation. Bills passed under reconciliation require only a bare Senate majority of 51 votes. Democrats lost their filibuster-proof 60-seat Senate supermajority with the election of Massachusetts GOP Sen. Scott Brown in January. Obama opened his remarks by targeting Anthem Blue Cross in California for recently boosting its rates by almost 40 percent. He was introduced by a diabetic Philadelphia-area woman who was told by her insurer in January that her rates would more than double. and it's a status quo that's unsustainable." Insurance companies, the president argued, have made a calculation. He cited a recent Goldman Sachs conference call in which an insurance broker told investors that insurers are willing to lose some customers through premium hikes because of an overall lack of competition in the industry. "They will keep doing this for as long as they can get away with it," he said. "How much higher do premiums have to rise until we do something about it? How many more Americans have to lose their health insurance? How many more businesses have to drop coverage?" Obama dismissed GOP criticism that his nearly $1 trillion proposal fails to sufficiently control spiraling medical costs. "You had 10 years," Obama said in reference to GOP control of Congress. "What were you doing?" He also brushed aside warnings by political observers that health care reform may lead to major Democratic losses in the looming midterm elections. Washington is "obsessed with the sport of politics," he said. "We have debated health care in Washington for more than a year. ... When's the right time? If not now, when? If not us, who?" The Senate's top Republican made clear Sunday that his party won't relax any of its efforts to block the overhaul package. "What the American people would like us to do is not make this gargantuan mistake," Senate Minority Leader Mitch McConnell told ABC's "This Week." And if the bill does go through, avoiding a Republican filibuster in the Senate by using reconciliation, the battle will move to its next stage, he added. "Every election this fall will be a referendum on this bill," McConnell warned. Obama said Monday that he's not inclined to take "advice about what's good for Democrats" from McConnell. But "the issue here is not the politics of it," he said - Congress and the president were sent to Washington to "solve the big challenges." I think any type of health care reform at this point in time is a dead duck. Too much controversey and discord over it. He is telling the truth. Regardless of how Republicans are fighting him, healthcare reform is needed. This is not a government take over. If this is a government take over and federal insurance is so bad, then members of congress should turn in their benefit packages that we are paying for them to enjoy. A definite change in our health care system is need, not necessarily this bill but a change. Prez is going after the private sector is a right step, the high price of health care just keep rising and services are being taken away. I have private insurance starting in 2004 my starting premium was $207. a month as of 2010 it has risen to $557 just for myself and some coverage has been taken away or changed. I can't shop for a better rate because of an 'PRE-EXISTING" condition I am type II diabetic so I am stuck. Not only Blue Cross of Calif but CIGNA who's CEO gets a bonus of over a million dollars, sound familiar.